This pamphlet was published by the Brinkley Hospital, Milford, Kansas. Dr. John Brinkley established the hospital in 1917. The cover of the pamphlet indicates that the hospital also operated a radio station with the call letters KFKB. 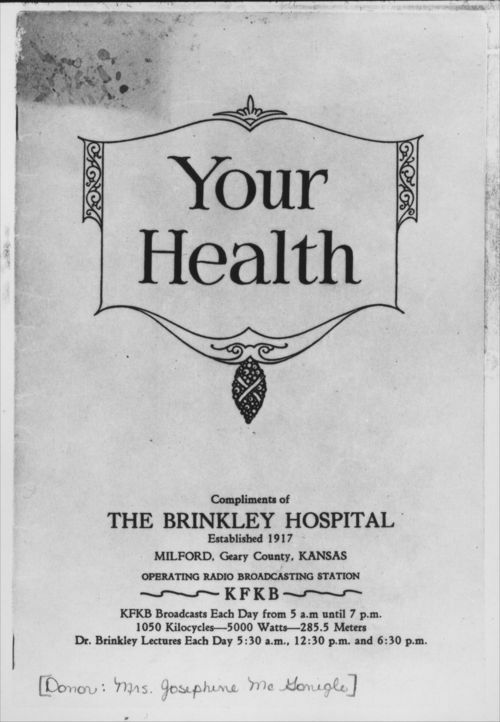 This pamphlet contains information about various health issues while promoting the services of the Brinkley Hospital. Dr. Brinkley specialized in several problems and diseases related to men such as prostate disease. The pamphlet includes photos of Brinkley, his family, and employees. It also contains interior views of the hospital facilities. Dr. Brinkley became notorious for his goat gland transplant operation.